Use professional looking resume fonts on your resumes. This is not the time to get creative or artistic, in most cases (unless, of course, you ARE an artist or creative career type). Fonts, fonts, and more fonts! Sometimes, your choices seem endless. If you have a word processing program and desktop publishing or greeting card software on your computer, you probably have more fonts than you know what to do with. That's all well and good if you're designing a card or a poster, or perhaps even a business card. So tempting, right? I know my daughter is always using some new font on every document she works on. But when it comes to resumes, you should limit your choices to just a few of the most well-recognized and easy-to-read fonts in your collection. Your goal is not to make your resume beautiful to your eyes... it's to make it extremely readable to the people doing the screening and hiring. Never use more than 2 fonts in a single document, including when you're writing a resume. It's OK to use variations in bold, italic, and different sizes, but for best results stick with one font for your headings, and if you must use a second font, then use it on your actual content. So, which resume fonts are best to use in resumes? For our purposes, let's divide fonts into 2 main categories: serif fonts and sans-serif fonts. Serif is just a word that translates to "tails" on the letters. 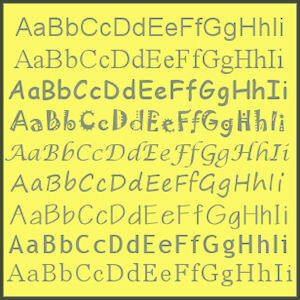 For instance, Times New Roman, which is pictured below, a popular font in most word processing programs, is a serif font. See the tails on the ends of the bar across the top of the "T"? Here are some more examples (with their names) of serif fonts appropriate for use in your resume. If you use these fonts for your headings, then use one of the sans-serif fonts described below for the rest of your resume. It's nice to have that contrast of styles between the header resume fonts and the body resume fonts. Also, you'll note in the sample at the left that the fonts appear to be different sizes. However, each one was the 20-point size. So you may need to experiment a bit to get your resume fonts to look the way you want them to. Sans serif basically means "without (sans) the tails (serif)." These are fonts like the popular Arial, that are more blocky in appearance. On a printed document, the sans serif fonts make striking headers, while the serif fonts are nicer for the main content. However, online, quite the opposite is true, so most websites you'll see (like this one) use a sans serif font in the text. Sans serif fonts tend to be easier to read on a computer screen, so they are the better choice for the bulk of your content online. So make your choice of resume fonts wisely, depending on whether your resume will be printed on paper... or viewed online. Above all, be sure that your resume is always easy-to-read and professional in appearance, and you can't go wrong.